The first video (10.2 MB) below is a computer slide presentation condensed into a web movie. The pictures cover the DomotexAsia Chinafloor Exhibition, bullet train trip from Beijing to Qingdao, visit to the Lao Shan Mountain area, and return to the Wangfujing Walking Street. The second video (4.4 MB) is a combination of 10 mpeg video segments taken with a digital camera, spliced together with sound dubbed back in from the original sound tracks of each segment. Dave's pictorial from the 2006 International Tourist Culture Festival Parade in Beijing : Includes photo "I Can See", awarded Second Prize in the "Beijing - An Olympic City in View" Photo Contest. Pictorial from Surfaces Expo 2003 : Held Jan. 29 - Jan. 31, 2003 in Las Vegas, pictures from the exhibition include the Floor Covering Installation Competition. Pictorial from the Floor Coverings 2003 Exhibition in Beijing : Held September 1-4, 2003 at the China International Exhibition Center. Pictorial from the Hebei Economic & Trade Fair and Langfang Agricultural Products Trade Fair : Held Oct. 18 - 21, 2003. 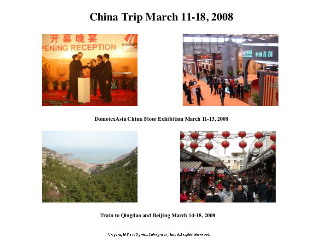 Pictures published on the Humboldt-China Network website. 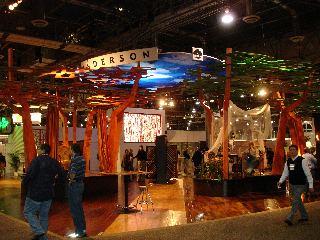 International Tile and Stone Show Review & Pictorial : Held Oct. 24 - 27, 2002 at the Sands Convention Center in Las Vegas. Pictorial from Floor Coverings 2002 in Beijing : Held Sept. 25 - 28, 2002 at the China International Exhibition Center, including shots of the Everyglory/Spreen booth. Pictorial from Surfaces 2002 : Held Jan. 29 - Feb. 1, 2002 in Las Vegas, including the Floor Covering Installation Contest press conference and Smokin' Joe Frazier signing autographs. FLOORS in Africa Magazine Celebrates 150th Issue : Reprint of founder Schalk Burger's article celebrating the150th issue of FLOORS in Africa magazine after introduction by US correspondent, Dave Spreen. Dave's pictorial from Surfaces 2001 : Held Jan. 30 - Feb. 2, 2001 in Las Vegas, including online chat with Jim Walker and press conference with Kathy Ireland. Photos from Floor Coverings 2001 in Beijing : Held Sept. 10-13, 2001 at the China International Exhibition Center. Photos from Hardwood Flooring Mills in Dalian : Dave's tour of 4 hardwood flooring mills Sept. 14-15, 2001. Sights In and Near Beijing : Photos with captions taken during Dave's visit Sept. 10-18, 2001. Photos from Floor Coverings 2000 in Beijing : Held Sept. 12-15, 2000 at the China International Exhibition Center. 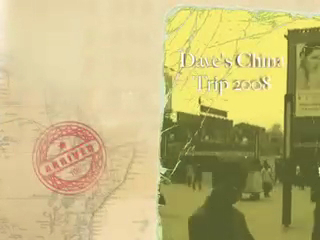 Photos from Tours and Side Streets of Beijing : Taken during Dave's visit Sept. 12-19, 2000. Photos from Tours and Side Streets of Beijing - Part 2 : Taken during Dave's visit Sept. 12-19, 2000.